Sisters from India prepare for the beautiful liturgical dance at the doxology of the Mass. 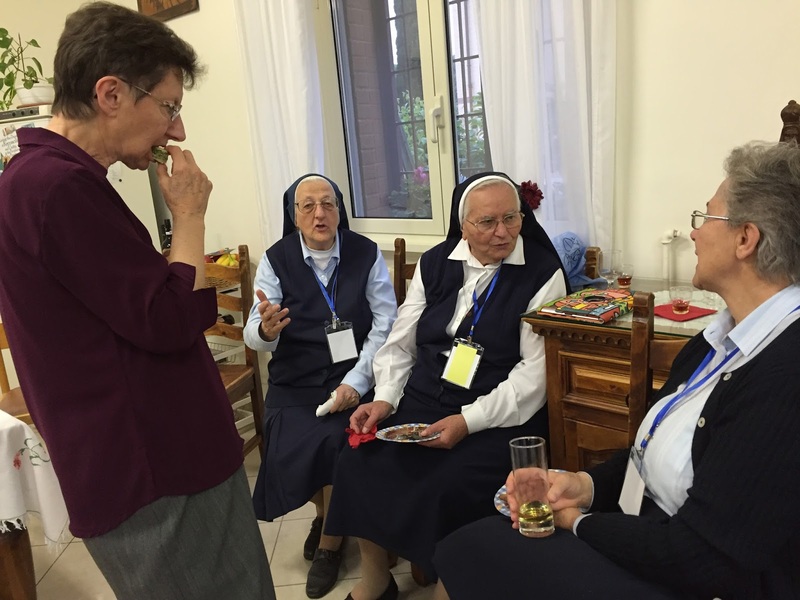 Cardinal Joao Braz de Aviz (Brazil), prefect of CICLSAL, speaks with some sisters prior to the concluding liturgy. 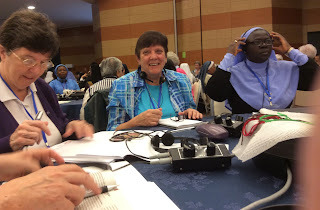 Sister Maxyne Schneider is in Rome attending a conference of the International Union of Superiors General--a worldwide, canonically approved organization of Superiors General of Institutes of Catholic Women Religious. At the start of the hour and a half audience UISG President, Carmen Sammut, MSOLA brought the greetings of the group to the Pope. 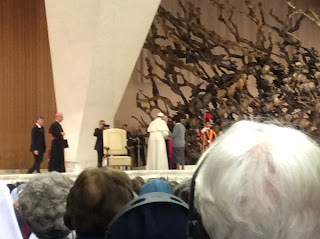 Questions from the membership were given to Pope Francis in advance and also were read aloud by a Sister. The first four questions, all had to do with the role of women in the church - decision making, preaching, participation at all levels. Questions had been solicited from across the world by the UISG to be given to the Pope. Receiving questions was his request. From among the submitted questions those that were similar were combined and sent to the Pope by Easter. 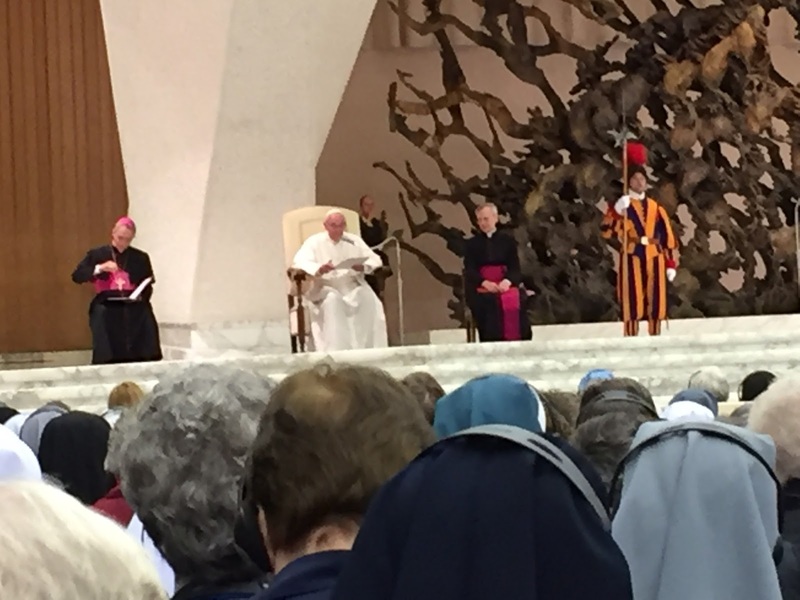 Pope Francis seemed utterly at ease, committing himself to the inclusion of women in the dicasteries, for example, but not going beyond current official boundaries in other cases. He made frequent references to pastoral circumstances from his years in Argentina and made a few very lighthearted and humorous remarks. There is much more to be said. I have been told that theZenit website might have full accounts of the audience. at one time, and now are at Providence Place. Our Sisters in Kenya also knew some of their Sisters. There is a new energy in the International Union of Superiors General (UISG). It was apparent last August at the meeting of the American constellation after the LCWR National Assembly in August, and it is very apparent at the triennial Plenary Assembly. 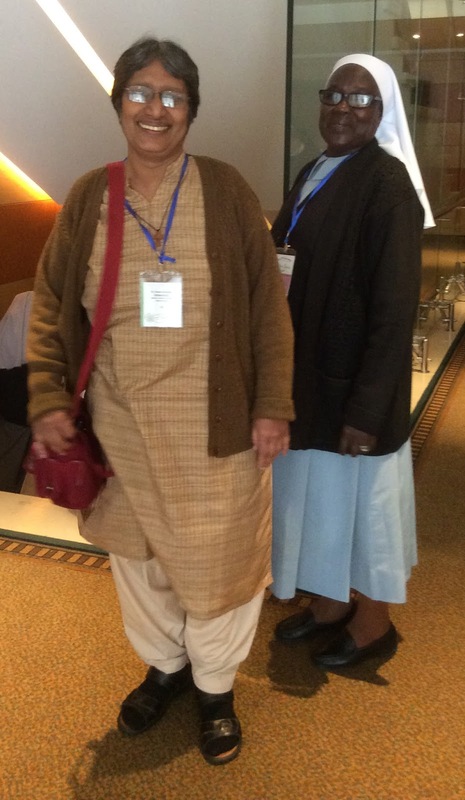 The IUSG is under the leadership of Executive Secretary Sr. Pat Murray, IBVM (Ireland), who had brought similar energy to leadership of Solidarity with South Sudan, and Carmen Sammut, MSOLA (Malta) as President. 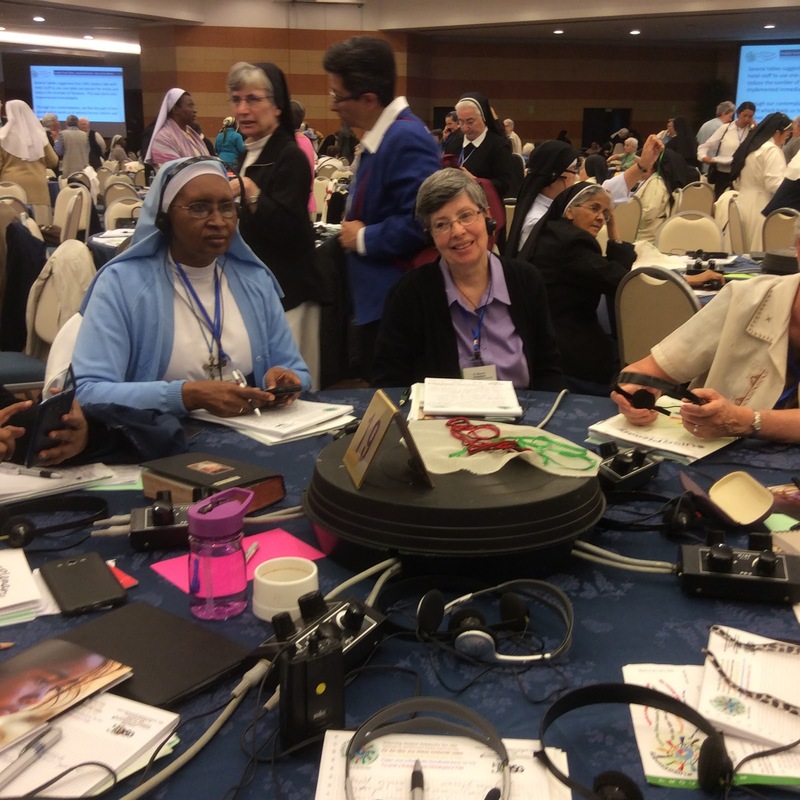 Now with a strong board and a strategic plan in the face of compelling world needs, the body representing more than a half million Sisters worldwide is far more than a forum for exchange of information. The UISG was established 50 years ago on the final day of the second Vatican Council. It was intended to be the counterpart to the corresponding organization for men religious which had existed for some time, the USG. As such, it would be the organization for the leaders of apostolic religious institutes of women. This is its golden Jubilee. 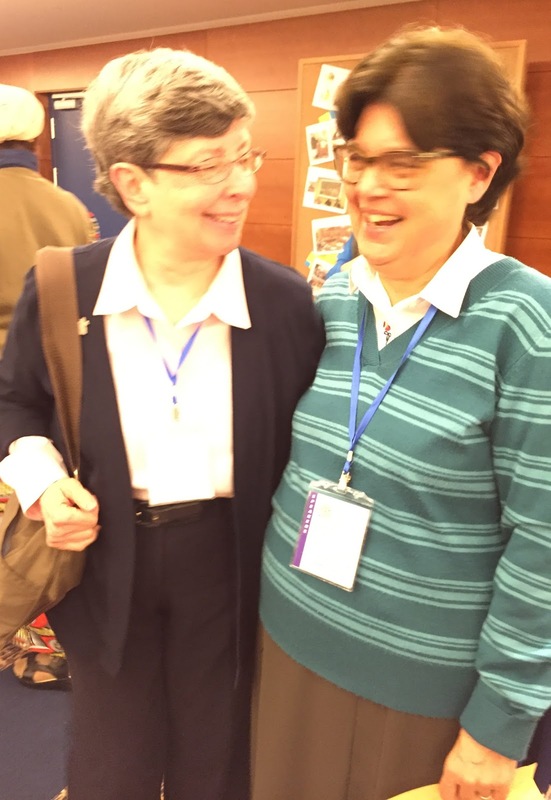 Last fall at the Synod on the family the IUSG took an important step in advocacy. While the USG, the men's organization, had always been considered equivalent to bishops and therefore would be given 10 seats at a synod, the women's organization, the IUSG, never had any ability to attend. This year the men offered the women one half of their positions. They presented that to the appropriate Vatican official and it was refused. However, the women were then given three positions at the Synod and were allowed as with all positions to have their three minutes of speaking time. While there is still much to be done in regard to the presence of women at the Vatican, this is one small step. 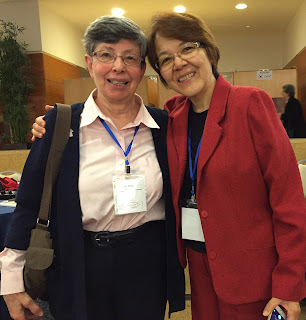 One of the future concerns is that there are 30 people who form the commission for the dicastery on religious life, CICLSAL, but there is not even one woman, though women make up most of the religious of the world. with direct inspiration from the Sisters in Le Puy. Last evening the Chambery Sisters invited all the Sisters of St. Joseph at the UISG for an evening of conversation (multilingual) and supper at their generalate house in Rome. 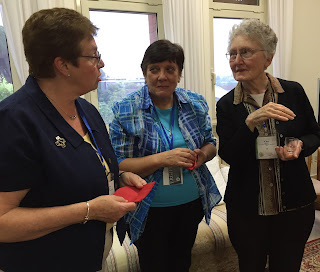 Talking to Sr. Rosemary Brennan from Boston and Sr. Monica Cavanaugh from Australia is Sr. Mary McKay of Carondelet, a close cousin of Sr. Judy Levins. I will write with more depth of content later, but I wanted to get some material to you before too much of the week has passed. The conference has significant depth of content and feeling in its formal presentations and conversations informally. There is a noticeable change from three years ago both in seriousness of intent and in a number of external factors that signal that change as well as the simple internationality of the conference. Three years ago there was simultaneous translation in six languages, while this time there are eleven with Polish, Chinese, Korean, Vietnamese and Japanese. At my English-speaking table there are Sisters from Ireland, Australia, Nigeria, India, Tanzania and the US. One leads a congregation of 7000 and another is from a community of 36. The theme, "Weaving Global Solidarity for Life," is meant as a recipe for effective action and not just a suggestion for pleasant pondering. There is much reference to the "charism of religious life" as an emerging reality in lives increasingly lived with global influence and global challenge. Carol Zinn, SSJ (Philadelphia) delivered a powerful address on Monday regarding our crossing a threshold for global solidarity for the life of the earth. Mary Sujita, SND yesterday, echoing Pope Francis, called us to the peripheries where our Sisters serve across the globe. Our hearts were at once gladdened and deeply moved with the poignancy of human suffering in the afternoon panel on the UISG efforts against human trafficking, overwhelming migration of refugees, solidarity with South Sudan and the profound tragedies being played out in the Middle East. These brief words hardly begin to touch the realities spoken of in sessions or privately as Sisters told of the lives of their congregations. 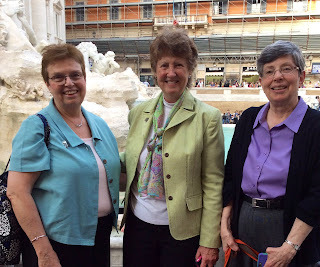 Tonight Sr. Sally Hodgon, CSJ (W. Hartford), Vice President of the UISG, has invited all the Sisters of St. Joseph at the conference to the Chambery residence for supper. I look forward to it. I am sorry that the superior from the Institute that includes Le Puy is not at the conference. Sr. Catherine Barange from Lyons will convey our greetings to her, however. the superior general of the"filles du Coeur de Marie" to greet her and express thanks for the hospitality of the DHMs. on the way to supper. Yes, wishes were made by all and mine included the Congregation!